A high velocity thriller, The Bourne Supremacy delivers bone-jarring stunts and highly kinetic chase scenes from within an intellectual premise. The human story of Jason Bourne still governs, and while the action is unstoppable, the characters dominate. CIA Deputy Director Pamela Landy (Joan Allen) runs a dangerous mission in Berlin to try and reveal the identity of a mole within the agency. The mission is disrupted by rogue Russian agent Kirill (Karl Urban) and turns into a disaster for Landy, with two men killed and a fingerprint left behind to implicate Jason Bourne (Matt Damon), the former black ops agent now living off the grid in India. Kirill is working on behalf of Russian oil tycoon Yuri Gretkov (Karel Roden), the beneficiary of $20 million in dirty CIA money. Deputy Director Ward Abbott (Brian Cox) and operations technician Nicky Parsons (Julia Stiles) join the effort to find and capture Bourne. 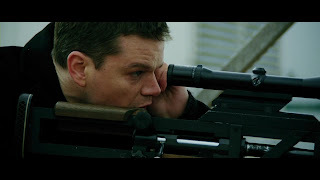 Kirill tries to dispatch Bourne but only succeeds in killing his girlfriend Marie (Franka Potente), spurring Bourne back into action. With Landy hot on his trail, Bourne has to clear his name, expose the mole, convince Landy that he had nothing to do with the Berlin killings, and survive Kirill's dogged attempts to eliminate him. Director Paul Greengrass sprinkles mesmerizing action scenes at all the right moments throughout The Bourne Supremacy, none more effective than a superbly edited and violent car chase through the streets of Moscow. It is difficult to imagine that cinematic car chases can still offer something new, but parking the realities of occupant injuries aside for just a few minutes, Greengrass allows Bourne's taxi to get clattered, swiped and spun around repeatedly and brutally as the chase hurtles towards its climax, Bourne deliberately bouncing his vehicle off other cars and obstacles to abruptly change direction and seize the upper hand. The other action set-pieces are not as eye-popping, but they are never less than professional. The dangerous cat and mouse game between Bourne and Landy is managed well, as they take turns in gaining the initiative and gradually build an understanding in a high stakes game where careers and lives are threatened at every decision. Matt Damon puts on his stone face and bulldozes his way through the movie, leaving Joan Allen to play the more expressive Pamela Landy. The barely concealed strain on Allen's face conveys both the risks she is forced to take and the unspoken tension of a woman ordering men around in the most masculine of covert activities. Franka Potente, Brian Cox and Julia Stiles lend strong support in small but pivotal roles, Cox particularly memorable as the senior CIA presence who has hatched and weathered more conspiracies than he cares to remember. The Bourne Supremacy mixes all the ingredients of the action genre in almost exactly the right proportions. Some originality may be lacking, but the tried and tested elements are polished to an impressive shine.